by Vintage by Crystal andThe Hole Thing. 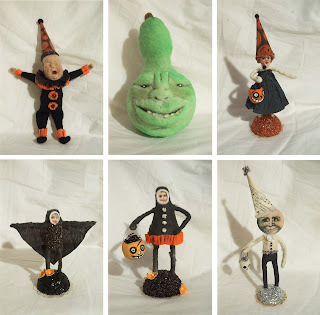 Vintage by Crystal is getting spooky for Halloween with these brand new spun cotton and needle felted figures! And the cool, crisp days of autumn tend to kick in those cocooning instincts. Spiff up your nest with The Hole Thing's latest felted vases and pots. I meant Adorable. So cute!! !